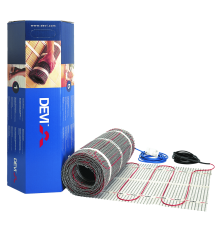 Devimat DSVF-150 underfloor heating mat is designed to be as thin as possible, only 2.5 mm, enabling underfloor heating installations into most high quality two-part adhesives with a minimum increase in floor height. 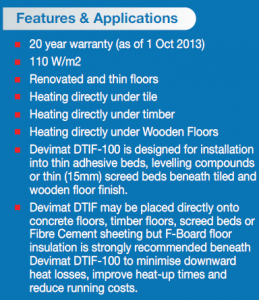 The Devimat system is suitable for installation into thin adhesive beds, levelling compounds or thin screeds on concrete floors, on fibre cement sheeting, or over existing tiles. 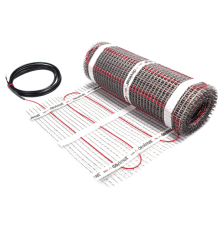 F-board insulation is strongly recommended under the heated area. 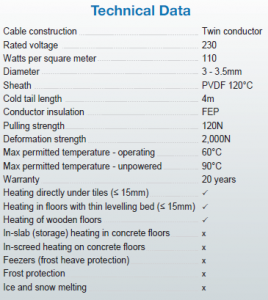 Made to Australian standards.